The entry to this private, gated subdivision climbs sharply through a winding granite canyon. Sculpted steel agave and dramatic boulder outcroppings mark the way into one of Troon North’s finest custom home subdivisions. 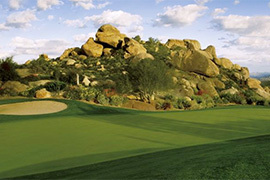 Here, the natural beauty of the boulder-strewn ridges and native vegetation blends flawlessly with the verdant greens of Troon North’s renowned Pinnacle and Monument golf courses. Most of these generously sized homesites feature magnificant views of lush green fairways, or the sparkling city lights far below.